Google VP for Android Hugo Barra has been the talking point of the tech community today, after announcing that he will end his five year spell at Mountain View with a move to up-and-coming Chinese smartphone maker Xiaomi. One suggestion is that Barra is leaving due to this tangled personal situation. 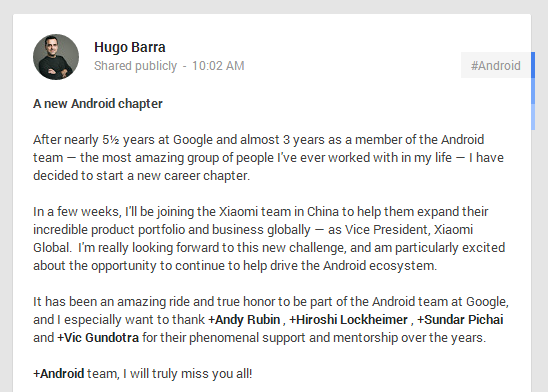 That speculation is a shame because it overshadows a huge piece of news: a Chinese Android startup has nabbed a key exec from the Android team itself. Barra wouldn’t have been short on offers, so his decision is a massive win for Xiaomi that hints at ambitous plans for its Android customization software. Of all the companies able to attract international execs, Xiaomi is probably the most likely. It’s built a reputation as ‘The Apple of China’ and a fast-growing and cool young company. In many ways, Xiaomi embodies the growth potential and unique factors of China’s mobile space, which, lest we forget, is the world’s largest smartphone market. The company has only been selling mobile devices for two years, its primary business is its MIUI Android customization and software services. It is only active in China (bar trial sales expansions in Taiwan and Hong Kong) yet already it is valued at $10 billion — based on recent funding — and is aiming to sell 20 million devices this year. For added drama, it recently overtook Apple on market share in China — though, of course, this is ‘low season’ for Apple as it prepares to launch new devices, reportedly at an event next month. 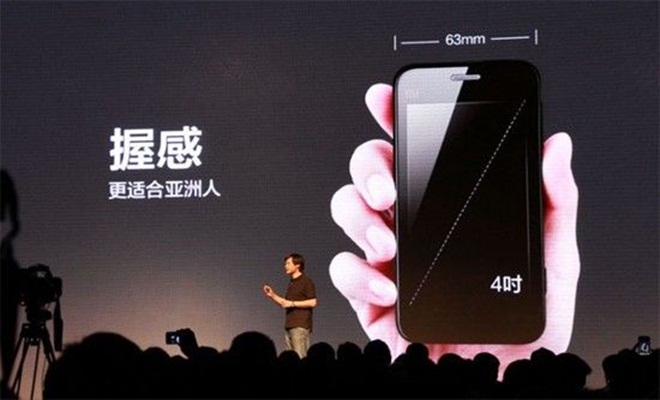 Xiaomi’s success has come from finding the sweet spot of mid-range, yet well-designed and functional devices in China. The average tech-enthused consumer can’t necessarily afford a new iPhone or Galaxy S4, but Xiaomi’s latest Mii2 range (priced upwards of around $240) is within budget, while its new Hongmi smartphone (priced at $130) is even more affordable. But there’s another factor: marketing. There are plenty of mid-range phones in China, and elsewhere, but Xiaomi has built a reputation (and perhaps even cult) around its brand, the design and user experience, as TNW’s Josh Ong pointed out last year. That and the leadership of CEO Lei Jun has brought about comparisons to Apple and Steve Jobs, but, as Lei himself argues, Xiaomi’s core business and revenue lies in content so it is actually more like Amazon, for those who feel the need to make a comparison. The results are impressive. Xiaomi sells its newest devices in limited batches, and the most recent batch of 100,000 Hongmi smartphones sold out in 90 seconds. In addition, nearly 7.5 million devices were reserved by fans who missed out. Xiaomi has never revealed its profit, but revenue for the first half of 2013 reached $2.15 billion after it sold 7.03 million devices. That’s just shy of the 7.19 million units it sold during the whole of 2012. Barra himself says he is “really looking forward to this new challenge,” and beyond his likely significant compensation, he will have a central role in taking one of Asia’s most promising startups global. He has become Xiaomi’s first ever Vice President of Global Business as it looks to seize the huge opportunity to grow overseas. Certainly, well-designed, affordable devices like Xiaomi’s have vast potential across Asia and other emerging markets, while equally they could be interesting additions to the market in western countries. Barra officially starts his role in October, but Xiaomi President and co-founder Bin Lin suggested that he may link up with the company for its upcoming media launch on September 5. That’s sure to add additional spice and media interest to the event. The final, intriguing part, is what Barra’s role will actually entail. Neither Google nor he have provided details beyond his international remit, but certainly hiring a man central to the Android ecosystem hints at Xiaomi’s ambition to grow its own Android customization software system into a global force. Perhaps to even take on Android itself? If it were simply about sales and business development, then Barra is not the right hire — his expertise and experience would fit with a bigger push for the Xiaomi MIUI Android ROM. Indeed, Lei said earlier this month that a smartphone is merely the ‘box’ through which services are delivered — this seems like the business Barra has been bought on to develop. Android forking is mainstream in China — where Google Play has no real footprint — and Google has allowed that to be, to a point. Android (in all forms) is said to account for 90 percent of smartphones sold, and it remains unclear if Google makes any kind of money from that — Internet giants Baidu and Alibaba are among the other companies that have built their own variants of the operating system. Google lost its usual ‘hands-off’ approach to Android last year, when it intervened last year to stop Acer from launching a device based on Alibaba’s Aliyun operating system, which it deemed to be an “incomplete” version of Android. While Google hasn’t had any issues with Xiaomi or MIUI (publicly, at least) it will be interesting to see what Xiaomi and Barra do, and how his former colleagues respond to it.